This kinetic copper finished wind sculpture will mesmerise you as you watch it gracefully spin in the wind. The twisted cage holds three iridescent marbles with one additional marble that swings from the metal chain for a stunning visual effect. 36cm long, comes ready to hang. Place this dynamic shiny metal spinner on your patio and watch the show begin. During the day you'll see a fantastic spinning sensation with any gentle breeze. As night falls, the light show begins. Powered by a solar panel at the top, the bubble filled acrylic ball will illuminate with seven cascading colours. Measures 17.75cm wide x 25.5cm long. Requires no batteries, recharges by the sun. Includes a karabiner for easy hanging in a sheltered area. Catch the wind with our airbrushed tri-coloured kinetic spinner. 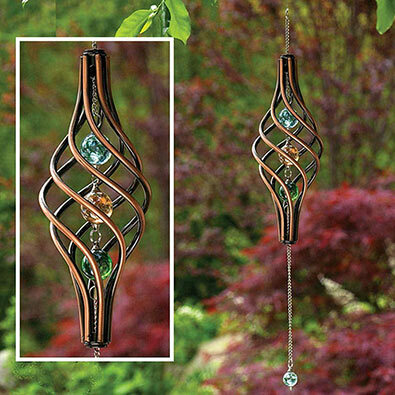 Each side spins in the opposite direction for a striking show in your yard or garden. Stands 188cm tall, 26cm stake and measures 42cm in diameter. Made of weather resistant metal. Simple assembly required, instructions included. Movement and light combine for a dramatic garden display. Two tiers of colourful metal petals spin in opposite directions. Nestled in the middle, the 8cm diameter solar glass ball emits colour-changing light by night. A slight breeze sends this spinner awhirl, while the solar powered LED cycles through vibrant colours after dark. Measures 69cm in diameter. Stands 188cm tall when staked, plus a 26cm fork to secure into the ground. Some assembly required. Made of airbrushed sheet metal and powdered coated steel. Instructions included. Add a shining kaleidoscope of colour to your landscape with our multicoloured metal wind spinner. Finished with bright metallic colours, the two sides spin independently on precision ball bearings in the slightest breeze. Measures 59cm in diameter and stands on a heavy-duty powder coated metal stake measuring 214cm tall. Weather safe finish. Our giant 46cm diameter spinner is a visual masterpiece powered by the wind. Counter motion spinner is designed so that the bottom and top spin in opposite directions, creating a hypnotic moving prism of metallic colours when in motion. Made of all weather metal, painted in shades of metallic blue, purple, pink and yellow. Powder coated steel stake stands 170cm tall, plus a 28cm fork for sturdy placement. Sure to be a show stopper in your yard or garden. Some assembly required, instructions included. Place this dynamic shiny metal spinner on your patio and watch the show begin. During the day you'll see a fantastic spinning sensation with any gentle breeze. As night falls, the light show begins. Powered by a solar panel at the top, the bubble filled acrylic ball will illuminate with seven cascading colours. Measures 18cm wide x 26cm long. Requires solar battery with on/off switch included. Includes a karabiner for easy hanging in a sheltered area. Our striking, brightly coloured spinner will catch the eye of any passersby. Highly polished enamel finish defies the elements and creates a rainbow of colours when spinning in the wind. The spiral tail adds to the spinning illusion with an acrylic crystal that reflects light in a prism of colours. Measures a generous 71cm long x 18cm wide plus a 10cm swivel hook at the top. Our solar-powered heart spinner charges by day to illuminate automatically at dusk with a rainbow of colour changing light. Hang on a bracket outdoors or on your patio to delicately spin in the breeze, or in a sunny window inside. The bright LED bulb is powered by an included rechargeable AAA NiMH battery. Made of durable silver-toned plastic with a crystal-like illuminated ball in the centre. Hangs from an included carabiner. Dimensional heart measures 15cm x 15cm and hangs 32cm long. Instructions included.